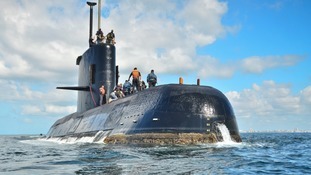 A missing submarine with 44 crewmen aboard has been found deep in the Atlantic a year after it disappeared, the Argentinian navy has said. The discovery was announced just two days after families of the missing sailors held a commemoration one year after the sub disappeared on November 15, 2017. During the retrofitting, the vessel was cut in half and had its engines and batteries replaced. Experts said refits can be difficult because they involve integrating systems produced by different manufacturers, and even the tiniest mistake during the cutting phase can put the safety of the ship and crew at risk. The navy said previously the captain reported on November 15 that water had entered the snorkel and caused one of the sub’s batteries to short-circuit. The captain later communicated that it had been contained. Some hours later, an explosion was detected near the time and place where the San Juan was last heard from. The navy said the blast could have been caused by a “concentration of hydrogen” triggered by the battery problem reported by the captain.